Disclosure: I am part of the RBC Rewards Back to School Blogger Campaign with Mom Central Canada and I receive special perks as part of my affiliation with this group. The opinions on this blog are my own. I’m sure we’ve all done this one time or another. We hear about a new site that sounds amazing and think “I could totally use this in my life”. Then a few weeks (maybe even days) later, we get overwhelmed by starting something new or completely forget about it. Now that isn’t to say that always happens to me because some times these good ideas we find become something we wouldn’t want to live without. RBC Rewards is one thing in my life that I’m glad I discovered many years ago! Today I want to share with you more about the RBC Rewards program and my experience with it. Hopefully it will be something that you can use on a regular basis and especially during this busy (and expensive) time of year: back to school! I’ve been an RBC customer for most of my adult life. I have multiple bank accounts, investments, a line of credit and my Signature® RBC Rewards Visa where I earn 1 RBC Rewards point for every $1 spent. Previously, I’ve been mainly earning my RBC Rewards points with my Visa purchases. I put most of my business expenses for my blog on my Visa every month so I’m racking up a steady amount of RBC Rewards points. Every so often, I’ll go into the RBC Rewards page and redeem my RBC Rewards points for gift cards. In the past I’ve redeemed my RBC Rewards points for multiple Future Shop Gift Cards and Home Depot gift cards. It’s nice a surprise when they show up in the mail! RBC Rewards members can redeem points for gift cards at over 50 top retailers, merchandise, over 100,000 Best Buy and Future Shop products and more! Did you know that there was another way to earn RBC Rewards? How did I not know about this????? 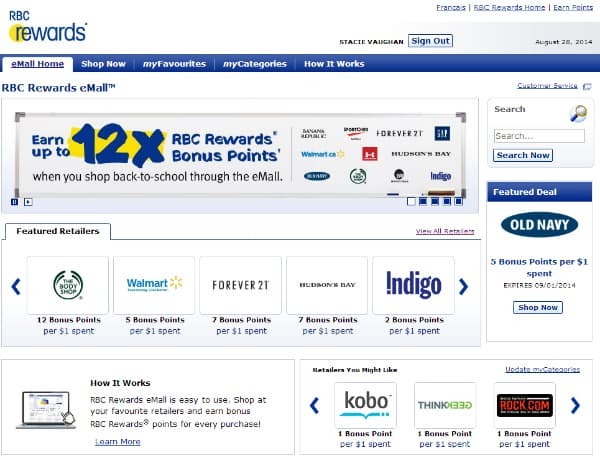 Now I can earn even more RBC Rewards points when I shop through RBCrewards.com! 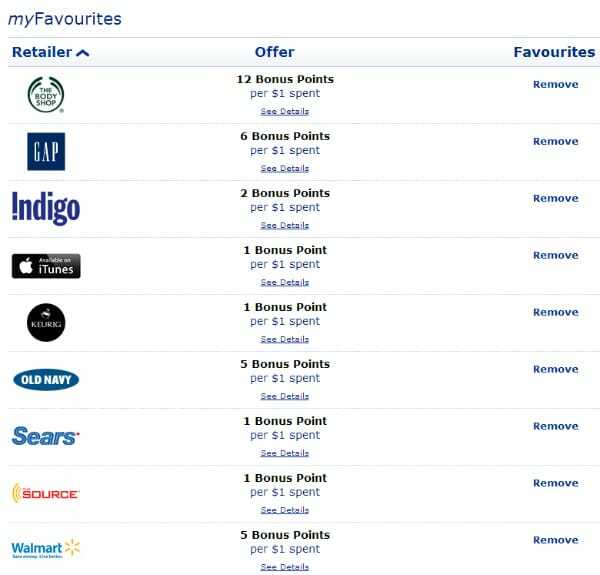 The RBC Rewards eMall has over 250 retailers that I shop at anyways. 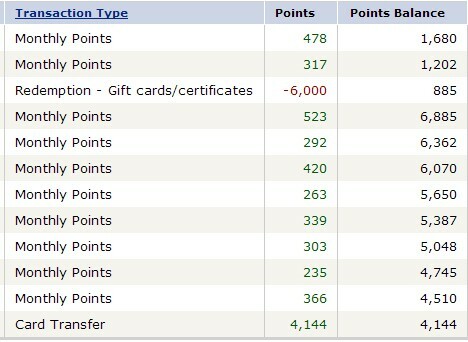 I do about 50% of my shopping online these days so it makes perfect sense to earn even more RBC Rewards points. I’m doing some of my back to school shopping online since we have a limited selection of stores where I live. I pay with RBC Visa and now when I shop through the eMall, I’ll be earning even more points. Sweet! You can earn TWELVE times the points just by shopping online for back-to-school through RBCrewards.com! RBC recently created “how-to” videos by moms on how to best use the RBCrewards.com site as a RBC Rewards member. You’ll learn how to redeem your RBC Rewards points to stretch your back-to-school budget, how to shop at the RBC Rewards eMall and more. I went through the list of retailers and made a list of my favourites. I’m racking up the bonus points as I shop for my girls to go back too school! Here’s just a few of my personal faves with details on bonus points! I love how easy it is to earn points! I’m saving up my RBC Rewards points that I’m earning now to go shopping for Christmas. Now that I know about the RBC Rewards eMall, I can shop there. Have I mentioned how great it is to be an RBC Rewards cardholder? Did you know about the RBC Rewards eMall? If you’re still working on your back-to-school shopping, I encourage you to check it out and earn those extra points! They add up quickly. Connect with RBC on Facebook and Twitter. Sorry if I am late to the party! We do our BTS shopping at Target!! Thanks!! Early, or when its on clearance lol my guys haven’t started yet but we both have our own businesses so its a good time to get that stuff, too. would love to win any of the gift cards! All over depending on what we need, this year most was at Superstore, but I have rainchecks for Walmart.